Good office acoustics and acoustical comfort is a key contributor to work performance and well-being in the workplace. The ability to find quiet times and places is essential to support complex work, while the ability to have planned or spontaneous interactions without disturbing others is necessary for team work and relationship development. Having speech privacy is necessary for confidential interactions and work processes. 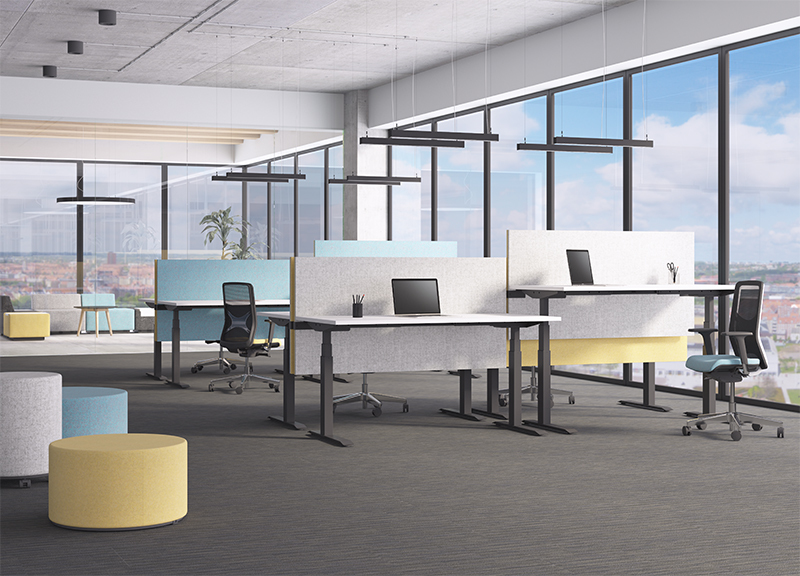 “Acoustical comfort” is achieved when the workplace provides appropriate acoustical support for interaction, confidentiality and concentrative work. Interior designer’s fondness for open-plan office layouts doesn’t look like it will end any time soon. As a result, acoustic problems within the workspace are a growing and pressing concern for today’s businesses. Unfortunately, a lot of companies are unaware that making a few adjustments to correct the acoustic landscape, can have wide-reaching benefits such as improved staff productivity and concentration. How do we solve noise issues? Lack of speech privacy – normally experienced in cellular and closed offices where sound may leak into adjoining spaces due to a range of situations including poor construction and/or lightweight partitions. Noise and concentration – Intensely packed working environments containing hard reflective surfaces that reverberate sounds, which result in a less productive working environment. A combination of both – most working environments suffer with a mixture of the two previously mentioned problems. Investing in good acoustics increases staff productivity, showing a viable return on investment in a fairly short period of time. If you visited NeoCon this year, you will have noticed that the buzz word was acoustics. There was a huge increase in design and production of acoustical pieces, such as quiet booths, wrap around chairs and sound absorbing materials. These are all great, but if you do not understand how acoustics work furniture alone will not help you rectify the problems. The best way to achieve a properly managed acoustic environment is through a carefully balanced combination of absorption, blocking and cover techniques. Referred to as the ABC of acoustics and it forms the basis of our successful approach. The use of products to absorb the sound energy that hits them and reduce unwanted, reflected sound energy from hard surfaces such as glass and concrete. The introduction of vertical barriers between the noise source and listener that blocks sound travelling from one to the other. The higher the barrier, the more effective the results. Sound masking systems reduce distractions and achieve privacy by distributing a comfortable, engineered background sound throughout the workplace. A computer-generated random sound covers or masks unwanted noise creating a sound with a pitch high enough to mask unwanted noises and low enough for comfort. It works because the human ear cannot distinguish sounds of similar volume and frequency. 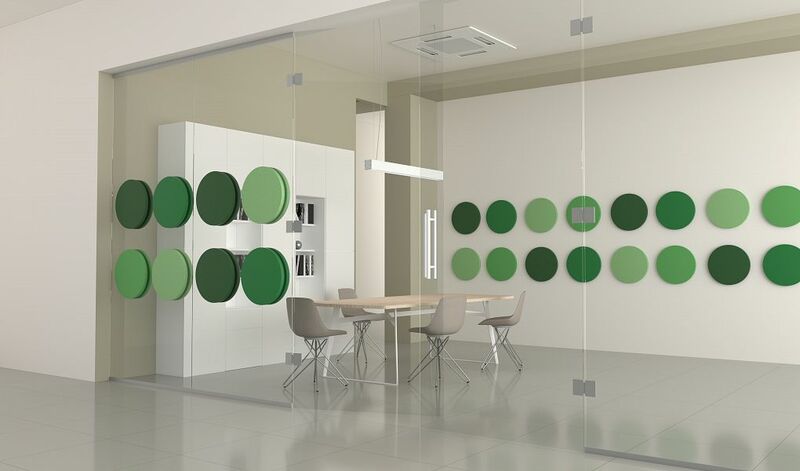 Acoustic wall panels are a fast and efficient way to master the reverberation at the office or indeed in the home. Depending on the needs they can be applied to all kinds of walls including glass surfaces or even furniture. Ceiling panels and acoustic screen panels which separate desks are also highly efficient for soundproofing and creating privacy. 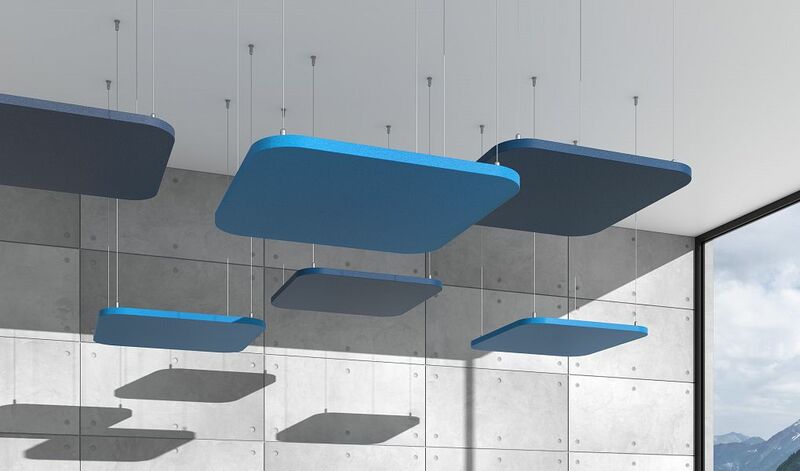 Acoustic panels are so versatile and are available in so many shapes, styles and sizes. As well as the acoustic value they instil, visually they look amazing and allow scope and range to create individual and unique commercial work spaces. 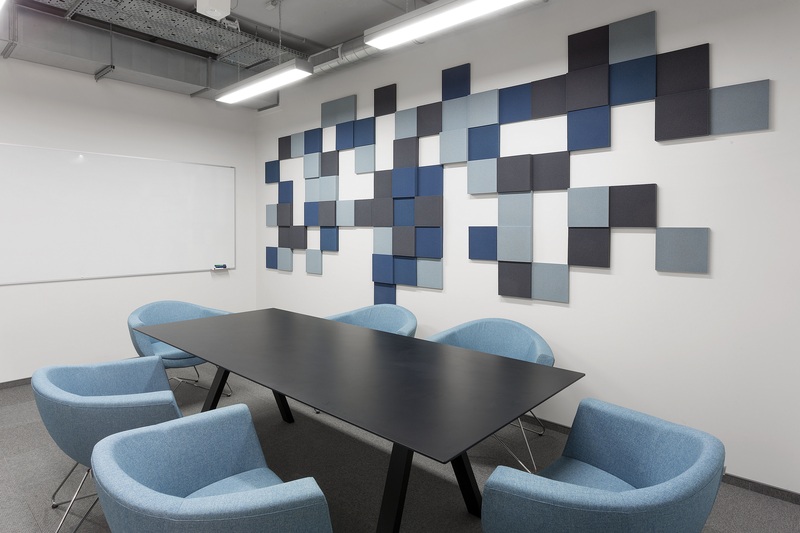 The Colour and texture that acoustic panels bring brightens any office and can compliment brand identity. Acoustic panelling in its many forms works well in any space, but particularly proficient in conference rooms, reception areas, open plan offices; basically anywhere noise needs to be reduced. Acoustic wall and ceiling solutions are one of the most popular noise reducing solutions used. Glass partition walls provide a great acoustic solution when structural changes are usually not a viable option. Partitioning technologies bring many space solutions while reducing ambient noise in open-plan workspaces without comprising on the original interior design. They give way for individual and private office space without complete isolation and allowing for light and comfort. 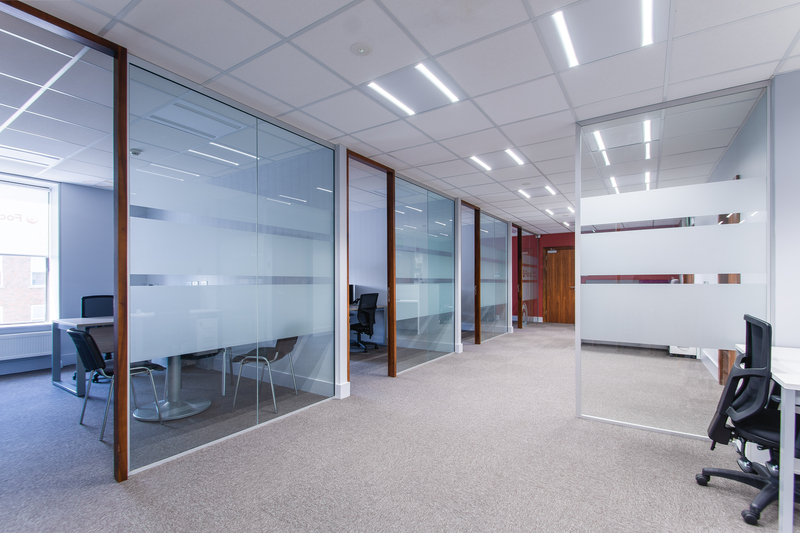 Using half-height glass partitions, you can significantly reduce ambient noise in problem areas while retaining all the positive features of an open-plan office. The portability of modular partitions also enables clients to experiment until the desired outcome is achieved. Acoustic furniture has exploded over the past few years, with so many amazing products on the market from Framery to Frovi, JDD to Profim and many more. Free standing acoustic pods, dens and booths create a secluded space for privacy and soundproof distraction-free zones. Acoustic pods are ideal for meetings, collaborative work and private working areas and are becoming an increasingly popular functional feature of the modern open plan office. Huntoffice Interiors provide a full range of Acoustic Fit out solutions, speak to one of our team today to find out more.